CCHCC Survey – can you help with 5 minutes of your time? Por favor ayude a CCHCC! Champaign County Health Care Consumers (CCHCC) wants to know how we can serve you and the community better. We have a brief survey that we would like to ask you to fill out – it takes about 5 minutes on average to complete. Click here to take our survey in English. Para tomar el cuestionario en español, oprima aqui. Whether you have received services from us, referred someone to us, or simply received information that we provide, we want to hear from you! The survey will help us understand how to better serve individuals and the community. If you can spare about 5 minutes of your time to take our survey, we would greatly appreciate it! 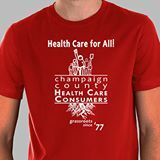 Champaign County Health Care Consumers (CCHCC) quiere saber cómo le podemos servir a usted y la comunidad mejor. Tenemos un cuestionario breve que quisiéramos que llenará- dura aproximadamente 5 minutos para completar. Si usted alguna vez recibió servicios de nostros, refirió a alguien a CCHCC, o simplemente recibió información de nosotros, queremos escuchar de usted! Este cuestionario nos ayudará a entender cómo servirle mejor a individuos y a la comunidad. Si usted puede tomar 5 minutos de su tiempo para completar el cuestionario, se lo agradeceriamos mucho! Muchas gracias por su ayuda! Thank you for your help!